With chips in hand, crowds of people got a taste of Tucson’s culinary and performing arts scene at the Southern Arizona Salsa and Tequila Challenge last Saturday night. 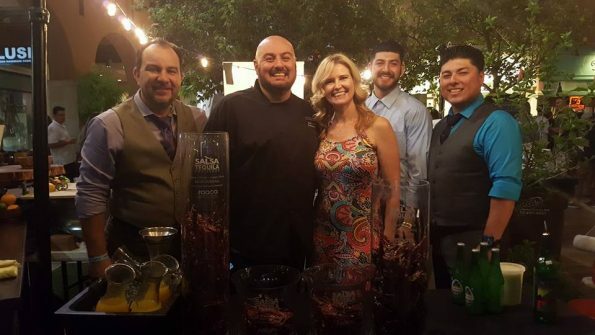 With more than 1,500 attendees, 45 participating restaurants, chefs, brewers and distillers, and nearly 100 recipes judged, the Salsa and Tequila Challenge brought the flavors of the Southwest to the La Encantada Shopping Center. As attendees sipped and tasted, this signature culinary fundraiser for Southern Arizona Arts and Cultural Alliance (SAACA) raised more than $44,000 for charity – the Community Food Bank of Southern Arizona and SAACA’ arts education and creative arts therapy programs for Veterans. This year the tequila competition was especially fierce, 22 cocktails ranging from the Spicy Pineapple Margarita presented by Dante’s Fire to the Infused Cucumber Mojito from Rigo’s Restaurant offered options for lovers of the sweet, the spicy, and everything in between. An unprecedented number of tequila distillers joined the competition, vying for the Judges Grand Reserve Tequila Tasting award. From Casino Del Sol’s ice sculpture to the flowing skirts of the Ballet Folklorico La Paloma dancers, the arts were alive around every corner. Paper flowers and hanging lanterns decorated the courtyards as Orquesta Salsarengue brought Latin rhythm to the main stage, and at the end of the evening a new champion was crowned.